Filed to: He's gonna end up with a '93 Corolla wagon anyway.Filed to: He's gonna end up with a '93 Corolla wagon anyway. 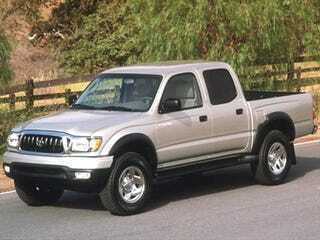 Do I dare consider the double-cab Tacoma? My neighbor has one and a tiny 7' trailer, and the most I stare at it the more it almost makes sense. Usual hurdles apply: one in exceptional condition pushes ***14 grand*** here. I've posted on here a bazillion times that Taco prices are so stupid that it's impossible to justify for me. Yet I've also learned that sometimes you get what you pay for. I ponied up for my wife's car and my IS, and I'm like, "Ohhhhhh this is what's like to have decent things. Very interesting..."